Estevan Florial does not have any MLB stats for the season. Signed by the Yankees as a non-drafted free agent on 3/19/15. Combined at Single-A Charleston and Single-A Tampa to bat .298/.372/.479 (125-for-420) with 77R, 23 doubles, 7 triples, 13HR, 57RBI, 50BB and 23SB in 110 games…ranked ﬁfth among Yankees minor leaguers in batting average and stolen bases…spent the majority of the season with Charleston, hitting .297 (102-for-344) with 64R, 21 doubles, 5 triples, 11HR, 43RBI, 41BB and 17SB in 91 games…was named a South Atlantic League Mid-Season and Postseason All-Star…ranked third in the SAL in OBP (.373) and SLG (.483) and fourth in BA…hit .378 (28-for-74) in June…was selected to the SiriusXM Futures All-Star Game in Miami…was promoted to Tampa on 8/1 and batted .303 (23-for-76) with 13R, 2 doubles, 2 triples, 2HR, 14RBI, 9BB and 6SB in 19 games…following the season, was named an Organization All-Star by MiLB.com; was also tabbed by Baseball America as the No. 2 prospect in the Yankees organization and No. 38 prospect in baseball…also appeared in 19 games for the Scottsdale Scorpions of the Arizona Fall League, hitting .286 (20-for-70) with 14R, 5 doubles, 2 triples and 4RBI…was named to the AFL Top Prospects Team. Spent the majority of the season with Rookie-level Pulaski, hitting .225 (53-for-236) with 36R, 10 doubles, 1 triple, 7HR, 25RBI and 10SB in 60 games…was ranked by Baseball America as the No. 3 prospect in the Appalachian League…also played in two games with Single-A Tampa (1-for-8) and ﬁve games with Single-A Charleston (.300, 6-for-20, 4R, 1 triple, 1HR, 5RBI)…overall, hit .227 (60-for-264) with 40R, 10 doubles, 8HR and 30RBI in 67 games. Made his professional debut with the DSL Yankees 1, batting .313/.394/.527 (70-for-224) with 51R, 11 doubles,8 triples, 7HR, 53RBI and 30BB in 57 games…ranked second in the DSL in slugging (.527) and third in RBI and OPS (.921)…batted .337 (57-for-169) against righties. April 4, 2019 Tampa Tarpons placed CF Estevan Florial on the 7-day injured list. February 1, 2019 New York Yankees invited non-roster OF Estevan Florial to spring training. July 19, 2018 Tampa Tarpons activated CF Estevan Florial from the 7-day injured list. July 18, 2018 Tampa Tarpons sent OF Estevan Florial on a rehab assignment to GCL Yankees West. July 17, 2018 Tampa Tarpons sent OF Estevan Florial on a rehab assignment to GCL Yankees East. July 16, 2018 Tampa Tarpons sent OF Estevan Florial on a rehab assignment to GCL Yankees West. July 13, 2018 Tampa Tarpons sent OF Estevan Florial on a rehab assignment to GCL Yankees East. July 12, 2018 Tampa Tarpons sent OF Estevan Florial on a rehab assignment to GCL Yankees East. July 12, 2018 Tampa Tarpons sent OF Estevan Florial on a rehab assignment to GCL Yankees West. July 10, 2018 Tampa Tarpons sent OF Estevan Florial on a rehab assignment to GCL Yankees East. July 10, 2018 Tampa Tarpons sent OF Estevan Florial on a rehab assignment to GCL Yankees West. July 5, 2018 Tampa Tarpons sent OF Estevan Florial on a rehab assignment to GCL Yankees West. May 18, 2018 Tampa Tarpons placed CF Estevan Florial on the 7-day disabled list. February 2, 2018 New York Yankees invited non-roster OF Estevan Florial to spring training. September 12, 2017 CF Estevan Florial assigned to Trenton Thunder from Tampa Yankees. August 24, 2017 Tampa Yankees activated CF Estevan Florial from the 7-day disabled list. August 17, 2017 Tampa Yankees placed CF Estevan Florial on the 7-day disabled list. August 1, 2017 CF Estevan Florial assigned to Tampa Yankees from Charleston RiverDogs. February 28, 2017 CF Estevan Florial assigned to New York Yankees. September 1, 2016 CF Estevan Florial assigned to Charleston RiverDogs from Pulaski Yankees. June 10, 2016 OF Estevan Florial assigned to Tampa Yankees. 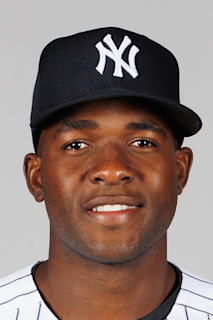 June 8, 2015 OF Estevan Florial assigned to DSL Yankees1. March 19, 2015 New York Yankees signed free agent CF Estevan Florial to a minor league contract.